I don’t consider myself to be a soap maker. I don’t render lard and add lye like Granny Clampett (though I do sound a bit like her and will probably look like her in 20 years or so, my granny did.) I guess I am a soap molder and mold maker? 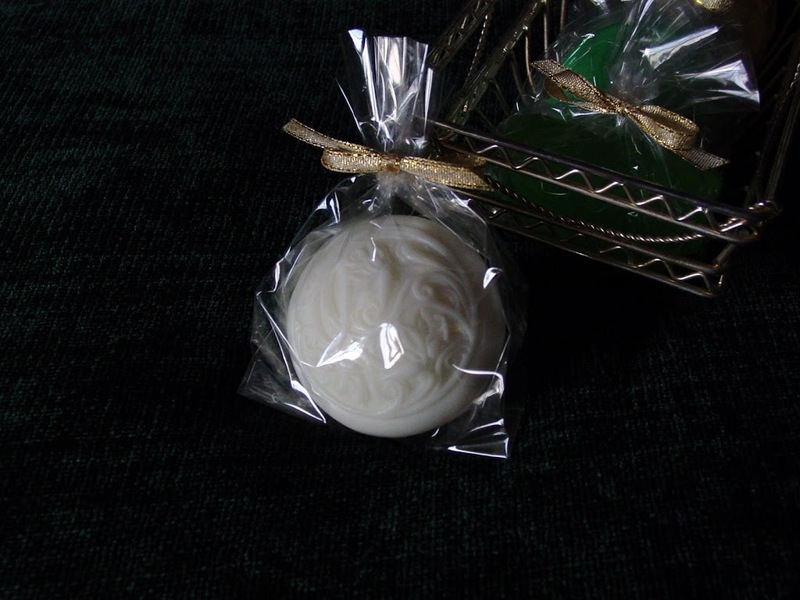 I make melt-and-pour glycerin soaps and love it! It reminds me of dyeing Easter eggs, except it smells GOOD! And, if you spill it, well wash it up, it’s soap for crying out loud! The gold bars are my favorites for Christmas giving. 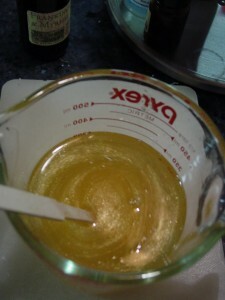 I add just a couple of drops of “gold” liquid color to melted, clear, melt-and-pour soap, followed by 1/4-1/2 tsp. gold mica powder. 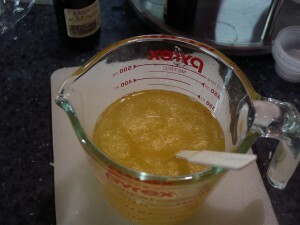 I love how it looks in the measuring cup as you swirl it around to distribute the powder! 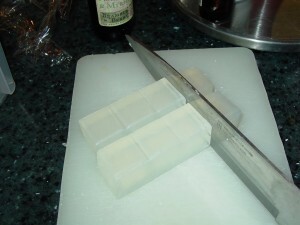 I add “Frankensence and Myrrh” fragrance oil from Bramble Berry, about 1 ml per bar. 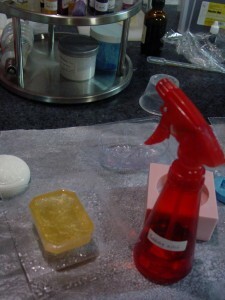 I pour my melted soap in my gemstone molds and spritz them with rubbing alcohol. That makes all the bubbles come to the top. 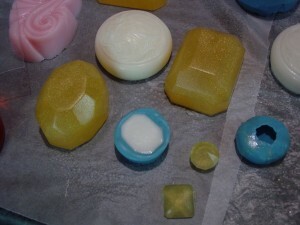 If I have any left over, I fill the little blue molds (another story) and make little soap beads! Because I pour in the basement where it’s cool, I don’t have to refrigerate my soaps to harden them. (They sweat when you do that, and you have to wait for them to dry before you polish and package them.) After a few hours, they’re ready to pop out of the mold and be prepared for giving! 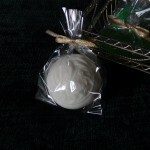 Between the fragrance oil and the gold mica, you have all the gifts for the Baby Jesus, wrapped up in one bar! Filed under Christmas, giving, molds, soap |	Comments Off on Let it Pour! I love my new mold! 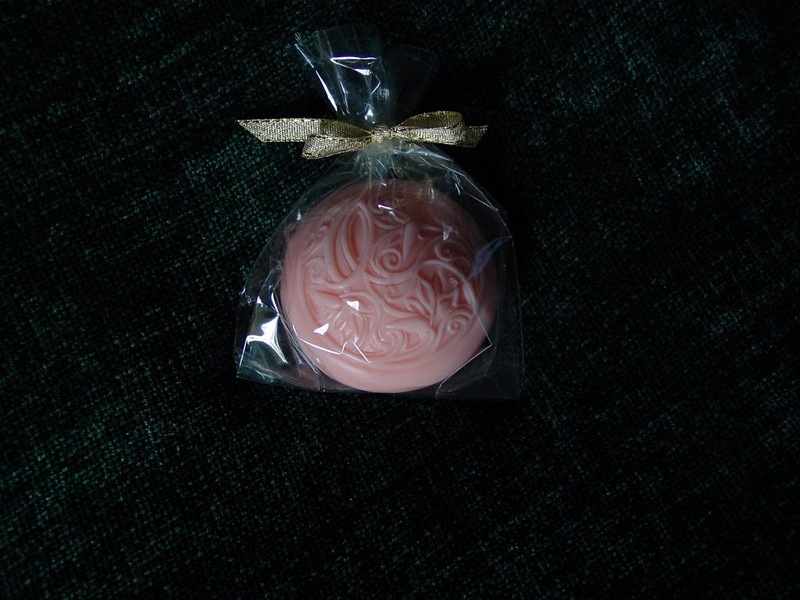 I think it is perfect for casting soaps that look like carved coral, ivory, or jade. 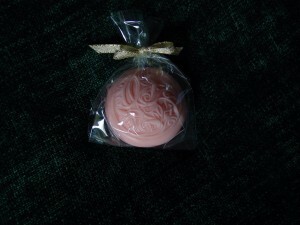 The coral one is scented with “fresh peach,” and the ivory one is “magnolia” scented. 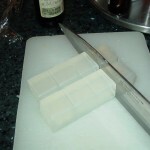 Filed under Gemsoaps, molds, soap |	Comments Off on I love my new mold!